Prices in our catalog are subject to change without notice. Please ask for the current price when you are ordering. Also, the chance of something being misprinted is possible. We apologize ahead of time for mistakes. Got a question about pricing or how to buy? Call us. We are available Monday through Friday 8A-6P Pacific Time and on Saturday 8A-5P. We are closed on Sunday. 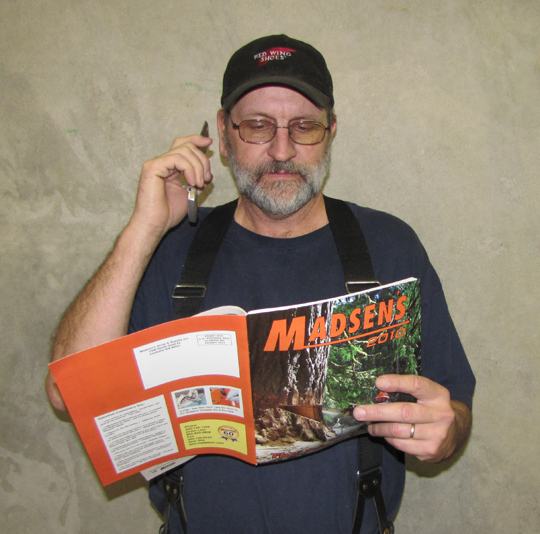 Quantity pricing accompanies most products and services listed on MADSEN'S web site. This extra discount is offered for buying in case or bundled quantities. Since it costs us less to handle bulk product, we pass the savings to you. If you are buying a very large quantity of a particular product, please call or fax us for a quote. We try to list quantity discounts that are realistic for an average logger or timber faller, but if you are a governmental or corporate buyer, negotiated prices are available on purchase volumes that exceed standard levels. If you need something that we don't have on hand, in many cases we can special order it for you. Our only requirement is that special orders be paid for in advance. You can do this with a credit card or by prepayment. All returns are subject to a 15% restock fee and some special order items are non-returnable. Please call for more specific information. If you are a governmental buyer, please ask about bid assistance. You may qualify for special pricing offered by a product's manufacturer. We are familiar with dealing with governmental entities. We know governmental buyers face unique challenges. If you require special paperwork or special billing, whatever it is, we will work to make it easy for you.